TRENTON — Gov. Murphy, who promised to build a "stronger and fairer" New Jersey during his campaign, said Tuesday he wants to pay for his ambitious agenda in large part by raising taxes on millionaires, corporations, and hedge fund managers. In addition to those popular liberal targets, Murphy is proposing new taxes on people lawmakers are generally more wary of alienating: consumers. Altogether, the levies would raise more than $1.5 billion to help pay for everything from public workers' pensions to schools and transit. Gov. Murphy wants to tax N.J. millionaires. What would that mean? Gov. Murphy is proposing raising taxes by $1.6 billion through new revenue sources. Amounts below are in millions. "This is a budget that is balanced both fiscally and morally," Murphy, a Democrat and former investment banker, told lawmakers and others gathered in the Assembly chamber for his address. "Our constitution requires the former, but our conscience demands the latter." Public-sector unions applauded the proposal as a win for working families, but there was no sign that Murphy had support from key members of his own party. If Democratic leaders were energized by Murphy's address, they didn't show it. Senate President Stephen Sweeney (D., Gloucester) and Assembly Speaker Craig Coughlin (D., Middlesex) declined to speak at length with reporters, instead issuing statements that promised a "thorough review" of the budget proposal. Both have said they are disinclined to raise taxes on millionaires. The Democratic-led Legislature must pass a budget for fiscal year 2019 by June 30. The governor can veto any line item, but may not add to it. Support in the audience seemed tepid enough that at one point, State Sen. Richard Codey (D., Essex), a Murphy ally, stood and motioned for his colleagues to applaud — like a basketball coach exhorting sleepy fans to cheer on their team. Republicans — who have lost considerable power in Trenton since former Gov. Chris Christie left office in January — warned that Murphy's proposal would hurt the state's already overburdened taxpayers. Murphy's spending plan would put a $50 million down payment on his goal of offering tuition-free community college by 2021, expand pre-K, create a child and dependent care tax credit for families earning less than $60,000, increase a tax credit for the working poor, and increase the state property tax deduction cap from $10,000 to $15,000. The plan also assumes the state will legalize marijuana by Jan. 1, 2019, and projects $60 million in revenue from pot sales; lawmakers have made little progress on legalization. The state would impose a 25 percent excise tax on sales of recreational marijuana and apply the sales tax, administration officials said. Murphy's budget also accounts for expanding access to medical marijuana, which would raise $20 million. Sticking to key campaign pledges, Murphy is proposing paying $3.2 billion to the pension system for 800,000 active and retired public workers and increasing aid to school districts by $284 million. He said the school funding formula enacted in 2008 needed to be "modernized," but didn't specify how. Murphy, who was elected in November to a four-year term, didn't mention Christie by name, but he repeatedly criticized his predecessor, saying the middle class would suffer if he didn't change course. "We are climbing out of the deep hole that our state has been stuck in for too long, and which President Trump and some in Congress seem intent on pushing us back into," he said. Central to Murphy's $37.4 billion spending plan is a 10.75 percent marginal tax rate on income above $1 million, which he projects would raise $765 million this calendar year. It would be retroactive to Jan. 1. The current top tax rate is 8.97 percent. "Yes, a millionaire's tax is the right thing to do – and now is the time to do it," Murphy said, as Sweeney and Coughlin sat expressionless behind him. Sweeney supported that idea during the Christie years, but now says it would lead wealthy people to leave the state, because they already got hit by President Trump's tax overhaul. 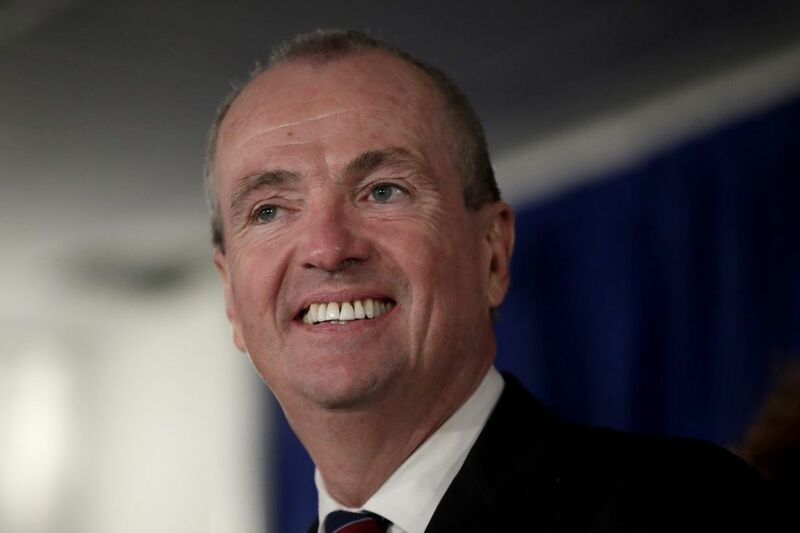 Murphy also wants to restore the sales tax to 7 percent; Christie and lawmakers had cut it to 6.625 percent as part of a deal to raise the gas tax. As a candidate, Murphy said he had no plans to reverse that cut. The governor said that tax cut has been "nearly imperceptible to the average family" but has "directly impacted our ability to provide better services to, and greater future investment in, that family." Murphy said the tax hike and broadening of what it covers would raise $581 million. "While Democrats want to say they are only increasing taxes on millionaires and corporations," the sales tax increase "would hurt all New Jerseyans," Senate Minority Leader Thomas H. Kean Jr, (R., Union) said in a statement. "It's beyond callous to say that New Jerseyans will not feel the impact of this change," he said. Murphy's plan would also broaden the tax, applying it to "transient accommodations" like Airbnb and ride-hailing services such as Uber and Lyft. He also wants to apply the tobacco products tax to e-cigarettes. In addition, Murphy wants to close a loophole that lets hedge fund managers pay relatively low capital gains taxes on profits. Under Murphy's plan, that money would be taxed as income, generating a projected $100 million. The budget includes a relatively small surplus of $743 million.